Going on Being | MARK EPSTEIN, M.D. The bestselling author of Going to Pieces Without Falling Apart combines a memoir of his own journey as a student of Buddhism and psychology with a powerful message about how cultivating true self-awareness and adopting a Buddhist understanding of change can free the mind. Before Mark Epstein became a medical student at Harvard and began training as a psychiatrist, he immersed himself in Buddhism through experiences with such influential Buddhist teachers as Ram Dass, Joseph Goldstein, and Jack Kornfield. The positive outlook of Buddhism and the meditative principle of living in the moment came to influence his study and practice of psychotherapy profoundly. 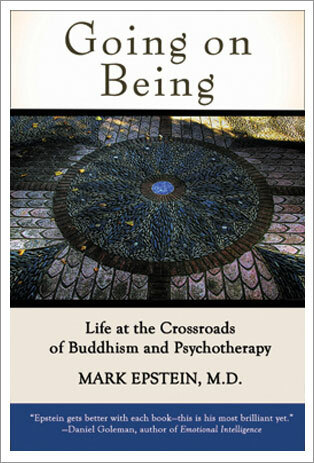 Going on Beingis Epstein’s memoir of his early years as a student of Buddhism and of how Buddhism shaped his approach to therapy. It is also a practical guide to how a Buddhist understanding of psychological problems makes change for the better possible. In psychotherapy, Epstein discovered a vital interpersonal parallel to meditation, but he also recognized Western psychology’s tendency to focus on problems, either by attempting to eliminate them or by going into them more deeply, and how this too often results in a frustrating “paralysis of analysis.” Buddhism opened his eyes to another way of change. Drawing on his own life and stories of his patients, he illuminates the concept of “going on being,” the capacity we all have to live in a fully aware and creative state unimpeded by constraints or expectations. By chronicling how Buddhism and psychotherapy shaped his own growth, Mark Epstein has written an intimate chronicle of the evolution of spirit and psyche, and a highly inviting guide for anyone seeking a new path and a new outlook on life. "Mark Epstein gets better and better with each book; Going on Being is his most brilliant yet. He weaves a mindful cartography of the human heart, tying together insights from Buddhism and psychoanalytic thought into an elegant, captivating tapestry. Epstein shares the spiritual and emotional insights garnered from his own life journey in a fascinating account of what it can mean to us all to go on being." "Every element of Mark Epstein's brilliant and beautiful new book is on the highest level–the spiritual insights, the psychotherapeutic perspective, and his own very human story of wanting to bring greater awareness and love into his life. Going on Being opens the door on what it means to understand ourselves, grow and change." "Mark Epstein's Going on Being joins the heart of psychotherapy with the heart of Buddhism. It takes us to freeing places, uplifts our lives. Honest, personal, searching–it affirms the goodness of our existence and encourages an openness that keeps us fresh." © 2013 Mark Epstein, M.D.